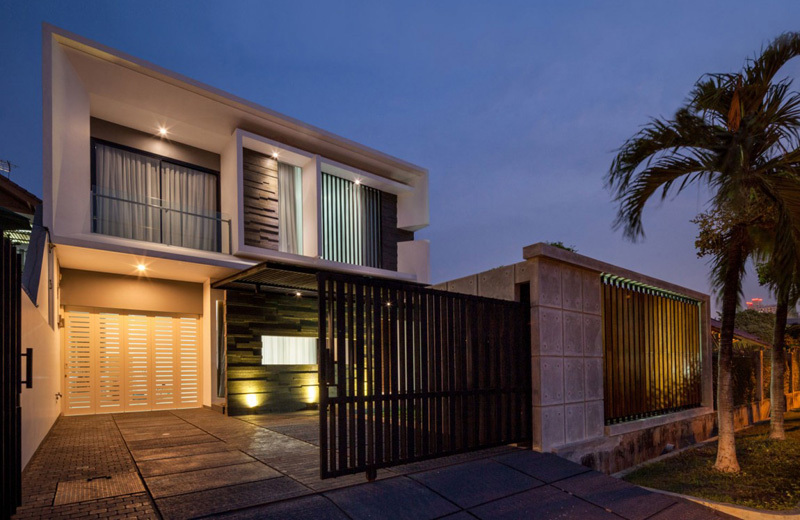 The beautiful residence has a tropical style design that makes it refreshing and relaxing. Do you know why many households choose to renovate their houses? What do you think is the main reason why they are not contented with the look of their houses? Indeed there are many households of today that are restless in making their house attractive and elegant for they believe in the real meaning of comfort which can be best achieved once they renovate it. Renovation is part of our ever changing generations as it will provide great accommodation. Well, today we will explore a house renovated and located on a land which is a part of 4 different sites that is owned by a single owner who is at the same time the head of the household. The house building eventually becomes the main house for two generations according to the owner which their children grew up. At the second location, there is a huge swimming pool and a large garden while the remaining sites are still vacant and unoccupied lots. Unique feature: The house features extraordinary designs and elements as you can see there was no partition between these four sites which in fact, visually creates the impression of unity. 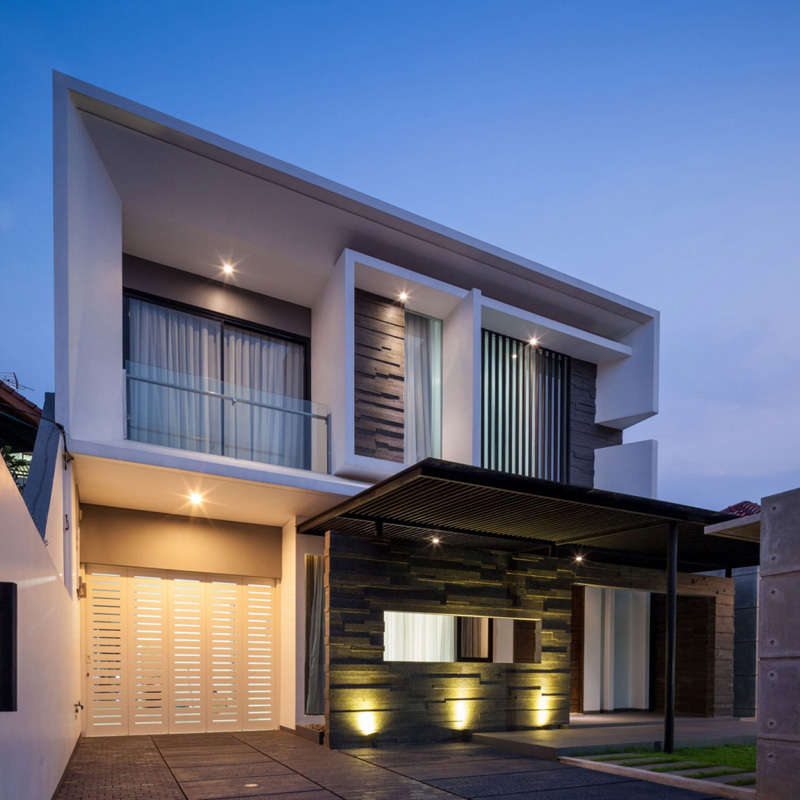 When the designer commissioned to design this house, there has been an existing building already. Geometrical forms of the house building are uncovered from the front space. 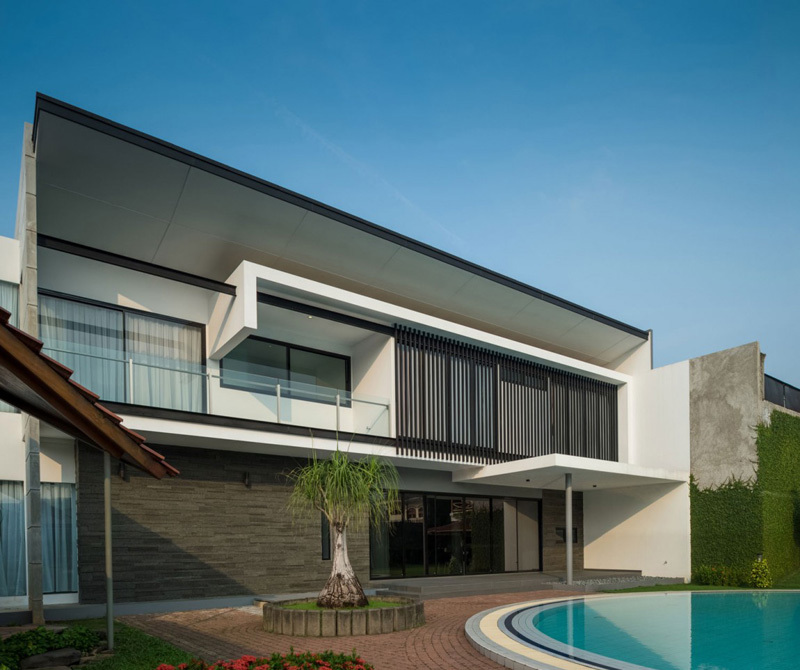 We can even see how the designer utilize the wooden, glass and concrete elements to make this house sustainable and fashionable. From the entrance, let us see how the designer manages to build the new house building. The remarkable texture of the house building is displayed from its walls and concreted pathways. 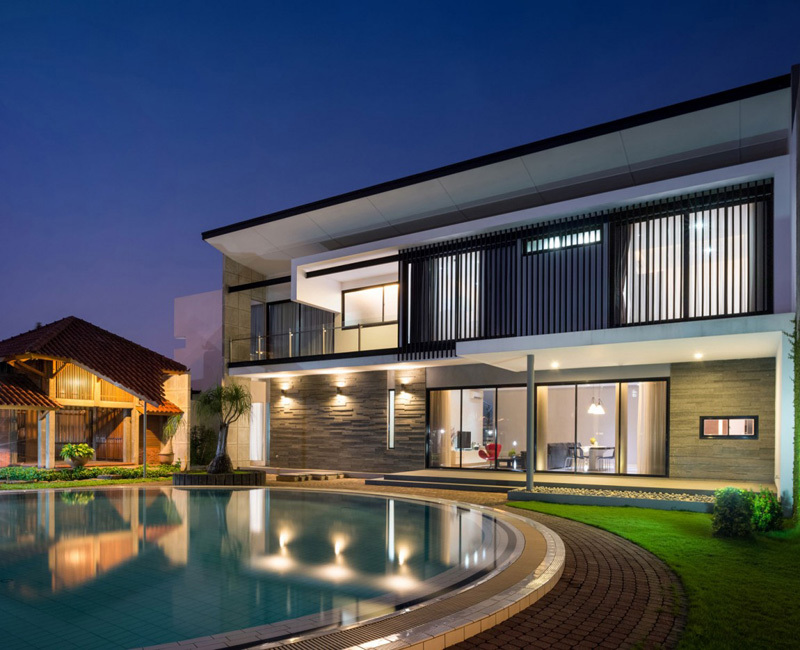 We may certainly be amazed of how the designer creatively built this house and perfectly jives with the elegant and luxurious large swimming pool at the center. High quality materials and costly furniture are well arranged in the interior. The color of this furniture blended well with the white and wooden brown themed living space. Looking at the plain white walls and ceramic tiles in the floor, we can say that elegance and luxury underlines the house design. Expensive furniture and accessories are carefully observed in every part of the indoor spaces. Remarkable lines and edges in the cabinets and kitchen tables speaks of modern and contemporary interior designs. 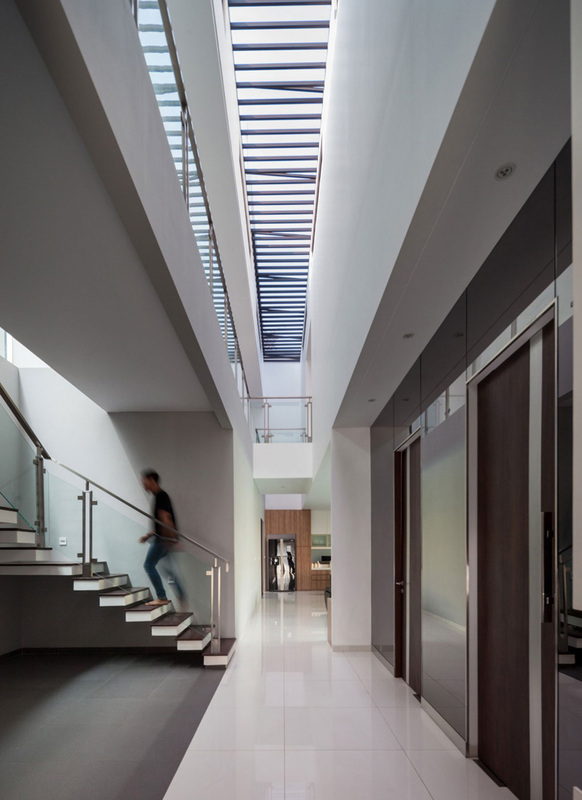 We can definitely see how the designer elegantly assigned this staircase here where the client can fully view the other parts of the interior. Here is the spacious bedroom where the homeowner can comfortably stay after work. 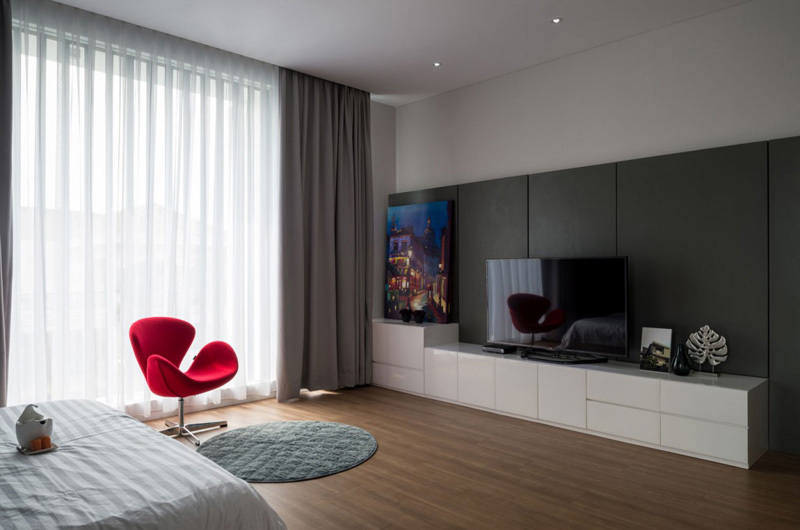 See how the designer stylishly place this red chair in the bed side and how it stand out in the white and black theme bedroom. High-quality expensive appliances is also available in this bedroom not just to improve the look of this are but also to offer a comfortable stay for the homeowner. 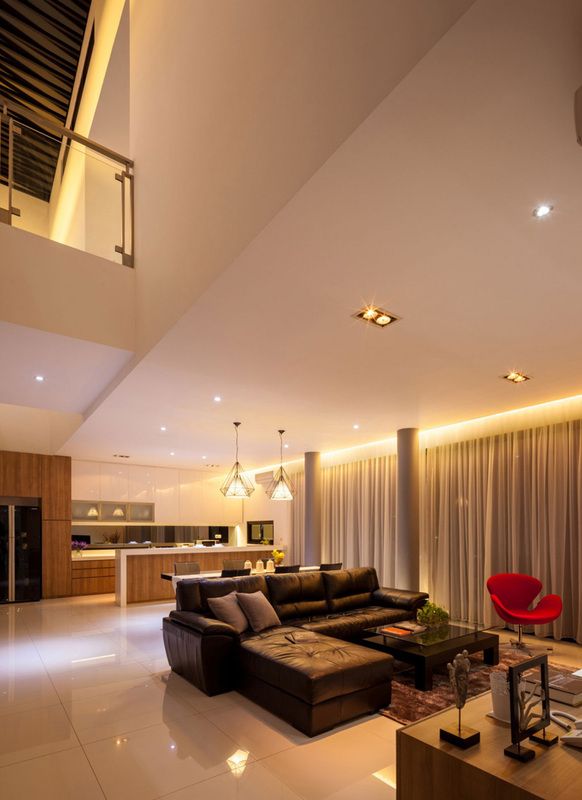 Sustainable lights can certainly reduce the electricity consumption of this house. 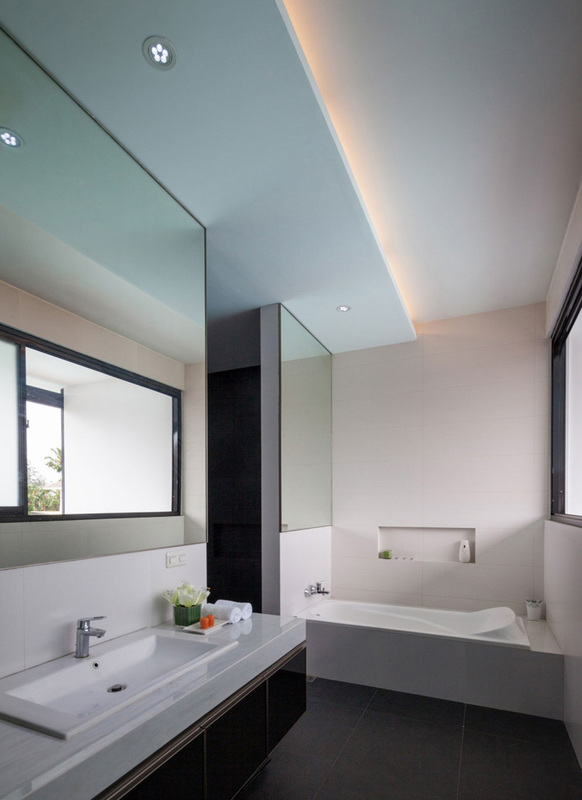 Huge mirrors add elegance and great style to this bathroom. 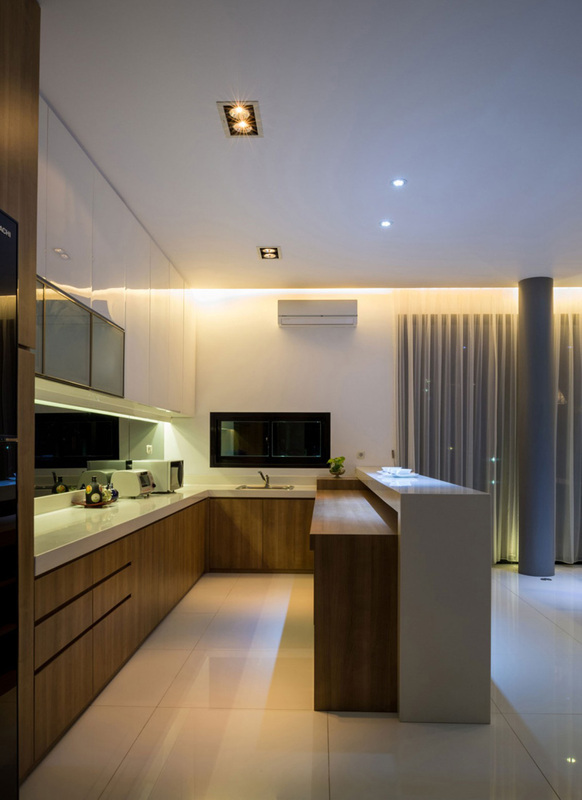 At night, the LED lights installed in the interior effectively set the romantic and comfortable mood in the living space. 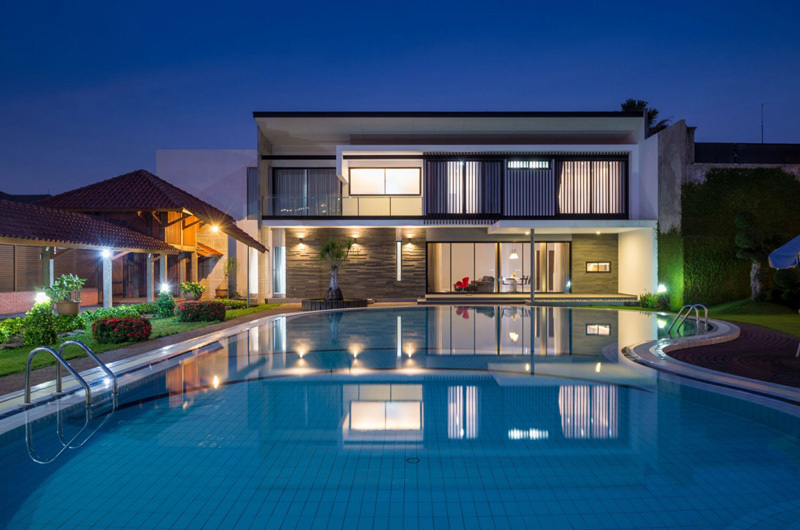 The exterior becomes more elegant as the LED lights uncover its enchanted features especially in the pool area. Kidney bean shaped swimming pool serves as the heart of the outdoor spaces where the homeowners can unwind at night. Observe how the designer maintains the pattern and lines in the walls, floors and even the arrangement of the lights here. The LED lights efficiently provides enough light at night here. Incredible lines and textures is what this modern architecture is made of. 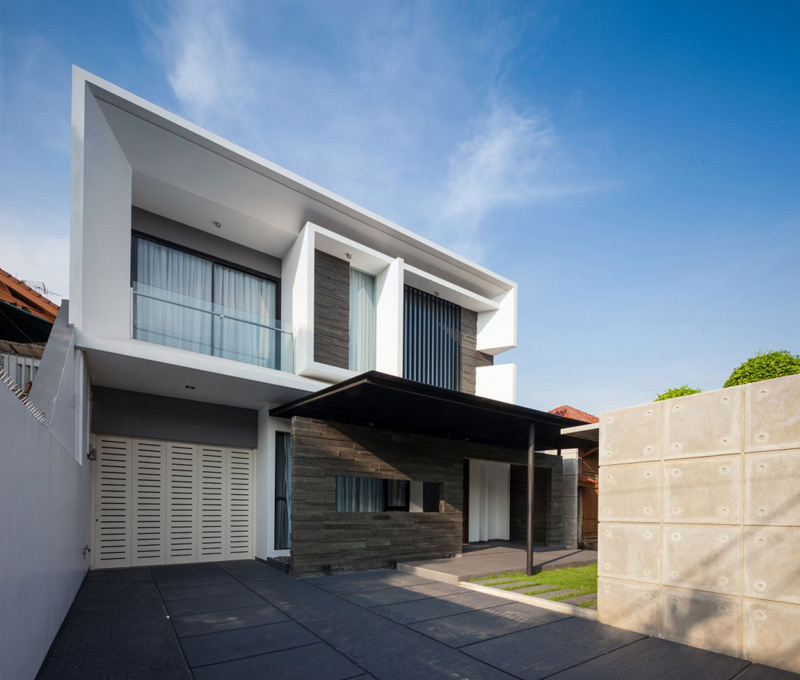 The house may look simple but still the undeniable elegance stands out among the other houses here. 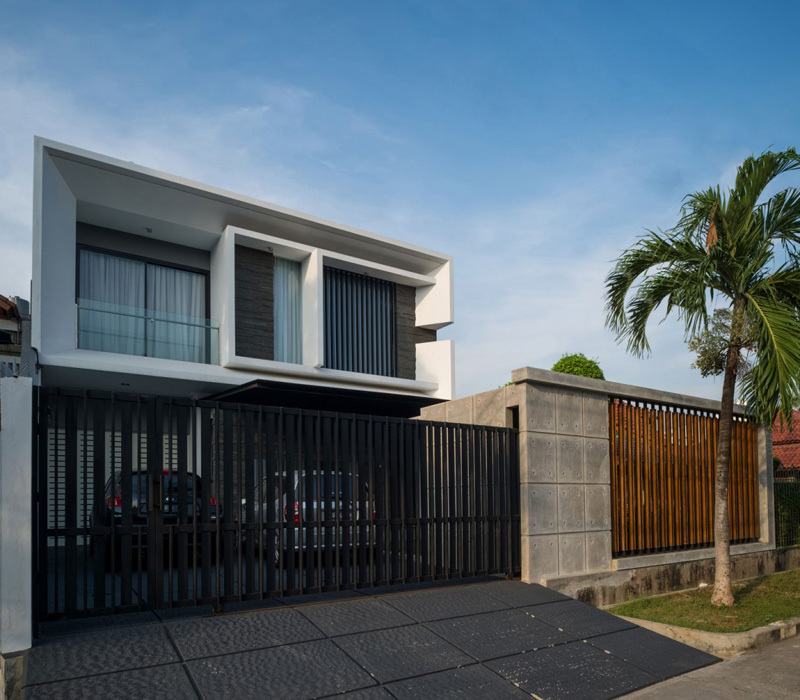 In the interiors and exteriors of this house, we can see how the DP+HS Architects artistically built the additional house. Definitely, the demands of the homeowner as well as the basic requirements were achieved. 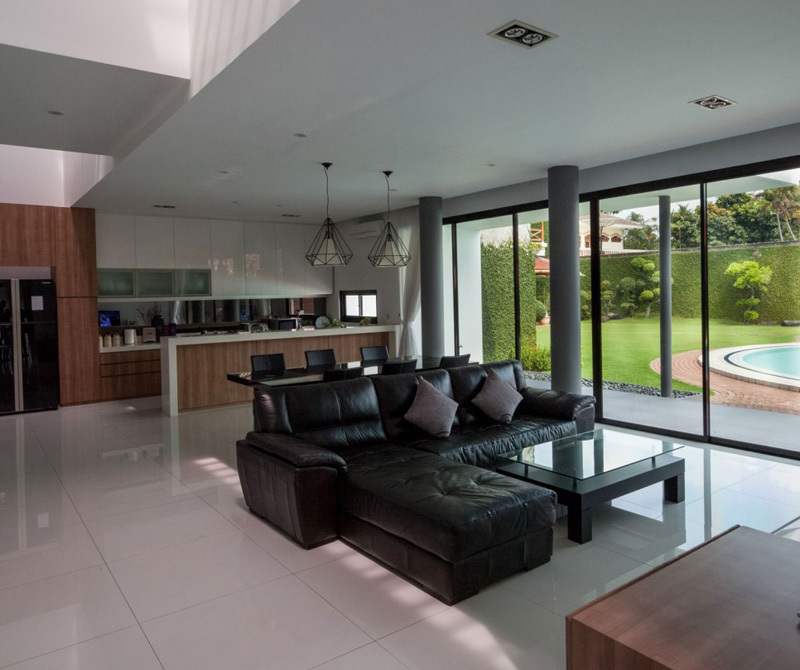 The tropical design style that includes air circulation scheme and natural lighting scheme are the best captivating features of the house. Also the idea of putting these two schemes together is part of the spatial experience. Fortunately, the spatial experience here is not only combining the two schemes with the aesthetic aspect but it also covers the functional aspects. As a whole we can see how the designer values the natural resources and its sustainability features in the house. We are sure that you may apply these features in your own house in the future.